Months after Hurricane Sandy struck, New Jersey Gov. Chris Christie — still trying to secure federal aid — continued to warn of debris languishing in the state’s waterways. As recently as February the Republican governor said there still was a “mind-boggling” amount of debris that needed removal, warning boaters not to be lulled by placid waters on the surface. “Everything you can imagine is sitting in our waterways,” he said. New York officials issued similar warnings, advising boaters that there would be serious issues if they ventured into Long Island Sound and the surrounding areas in the wake of the storm that caused $650 million worth of damage to boats, including 1,400 that sank. Although sympathetic to the push for federal aid, people in the marine industry were concerned the warnings would deter boaters from getting back on the water as the season approached. So members of the Marine Trades Association of New Jersey began boarding their own boats, or those they were selling from their dealerships, and surveying the waters firsthand. Despite a late spring, they went out to learn whether it was truly as hazardous as officials were making it sound. With GoBoatingNJ.com, the trade group is getting the word out, posting videos of boaters traveling through areas affected by storm debris. In some cases, the group says it found locations that were cleaner than they had been prior to the storm. The group planned to launch “Want to know? We will go!” in late May as part of the effort so boaters with concerns about specific areas can see whether those waterways are navigable. MTA/NJ also planned to launch a video contest on Facebook. 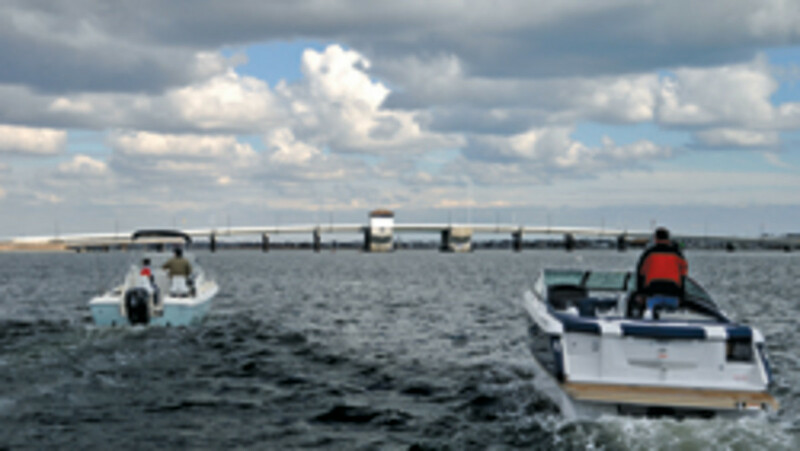 The MTA/NJ had been working closely with state agencies and knew debris was being cleared, but word wasn’t getting out to boaters despite the group’s efforts at boat shows to let people know that many waterways were safe. “I don’t think any of us felt like it was enough,” Danko says. Six months to the day after Sandy hit, and only about a month or two after the GoBoatingNJ effort launched, the federal government signed off on $1.8 billion in aid to help recovery efforts. An allocation of $50 million will be used to provide critical funding support to municipalities by helping to subsidize the local match for Federal Emergency Management Agency public assistance projects. This will ensure that local governments have sufficient resources to continue providing essential services without resorting to tax increases or other measures that may cause further hardship. Danko says the approval couldn’t have come too soon. “We’re still fighting really hard to get businesses money,” she says. Shore-area businesses damaged by Sandy and falling short of the money they need to recover may be eligible for grants of as much as $50,000 through a state program. The Stronger New Jersey Business Grant Program was expected to begin taking applications in early May and begin doling out money later in the month. In May, the administration touted the demolition of a Mantoloking home that had been swept into Barnegat Bay and remained there for months. Underwater obstructions that can’t be removed immediately are being marked to enable boaters to safely navigate, according to the state Department of Environmental Protection. The agency will work with the Marine Services Bureau of the state police, the state Department of Transportation, the Coast Guard and municipalities to assess boating safety as cleanup progresses, and it will issue navigational and public safety announcements as needed. Dredging will be done as needed, with a priority placed on areas where there is a blockage of storm sewer outfalls and shoals near marinas and other heavily traveled areas. As much as New Jersey marine businesses hope the funding will help, they also hope the videos will spread the word that although boaters should always remain cautious, concerns about debris shouldn’t deter them from going boating.